Christmas is just the time for big ticket gifts, and throughout history (or at least, since I was a kid) the biggest of big ticket gifts is a new bike. For the benefit of those little people among us who aren’t quite ready for a bike yet, we’ve found all sorts of other things to ride as well, suitable even for babies who’ve just learnt to sit. So come and have a look at Babyology’s pick of the very best toys to ride. The Wishbone bike (at top) is the brainchild of Wishbone Design Studios in the US, and is a 3-in-1 learn to ride bike suitable for kids from age one to five. Start it off as a tricycle, and then convert to a two wheeled balance bike (in two different heights) as your child grows. It comes in plenty of different styles and colours and just look at those tyres! They’ll take anything your toddler can ride them over. Check out all the versions and buy direct from Wishbone. Prices for the 3-in-1 bike start as US$229. Here’s a balance bike for kids who aren’t babies anymore. 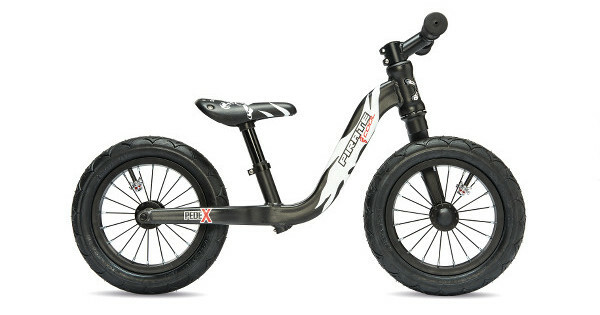 It’s the Pedex Pirate balance bike and it’s sure to make some little children feel all grown up this Christmas. With all-terrain wheels, a matt black finish and a lightweight frame, it’s just the thing to get kids as young as 18 months up and riding. We especially love the attention to detail – it has tiny little skull and crossbone valve caps on the tyres! You’ll find it at S’cool Bikes for $259. And now something for the much younger set! 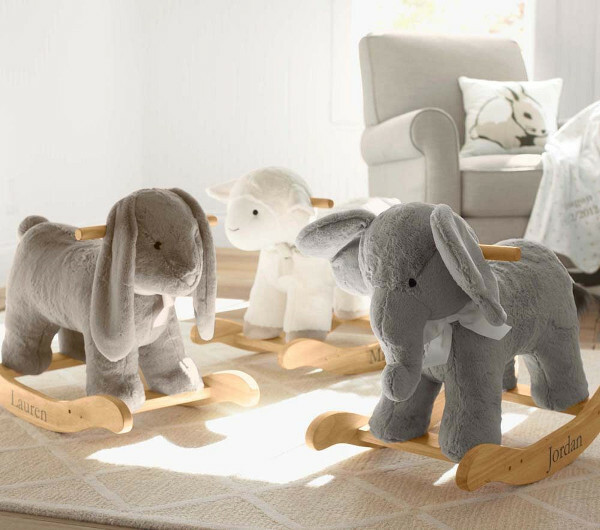 These gorgeous plush rockers from Pottery Barn Kids are sure to have you oohing and ahhing on Christmas morning. With a sweet bunny, lamb, bear or elephant to choose from, this huggable rocker is low to the ground and easy to ride so littlies are sure to be thrilled with these. Suitable for children from 18 months to three years, they’re $188 from Pottery Barn Kids. Yes, it looks just like a toy truck, but actually it’s much more. 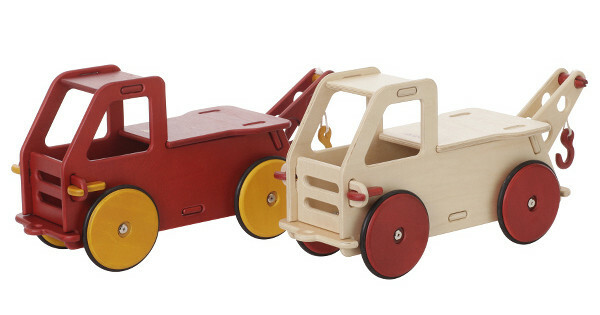 It’s the Moover Toys Baby Truck from Danish by Design, and not only can you use it to take teddies and toys for a ride, but it’s a ride on toy for your toddler too! What’s more, Moover’s unique click system means your child can have fun taking the truck apart and reassembling it as well. It’s $119.95 at Danish by Design. If you’re after a lightweight yet serious first bicycle, it’s hard to go past this one from ByK . It’s the E-350 and it has everything you need to get kids up and riding on two wheels (and enjoying it!). 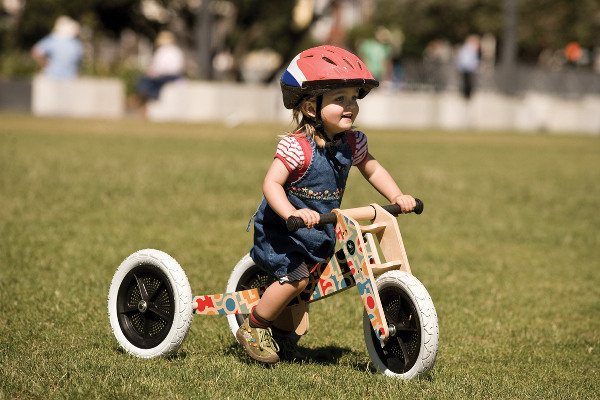 It has easy braking, and because it’s lightweight, it’s not hard to get pedalling the way it can be on lots of kids’ bikes, so kids won’t be tired out before they’ve made progress. It comes in a great range of fun colours, and includes training wheels as a standard extra. It’s $299 and you can find a stockist near you at ByK. They might not be up to riding a bike yet, but that doesn’t mean kids can’t get moving and jumping, especially on something as fun as Rufus the Reindeer from Bop Along Buddies. With antlers to hang onto for a secure ride, he’s the perfect Christmas-themed jumping toy! If you prefer something less seasonal, there are plenty of other animals in the Bop Along Buddies range, which are a great reimagining of the old school Space Hopper. They’re pretty strong and will take kids up to 70kg for a ride. Rufus and most of his friends are $39.95, along with some extra large versions for $59.95. You can buy them online at Bop Along Buddies. The gorgeous Wheely Bug has long been a Babyology favourite and with so many cute characters to choose from, it’s sure to become a favourite for your child too. 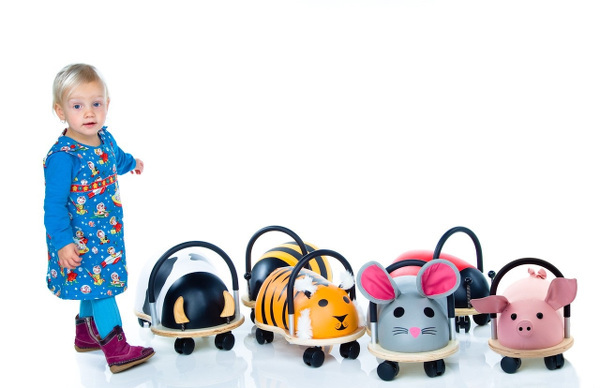 Choose from not just the classic Wheely Bug ladybug or bee, but now also from a cow, pig, mouse or tiger. 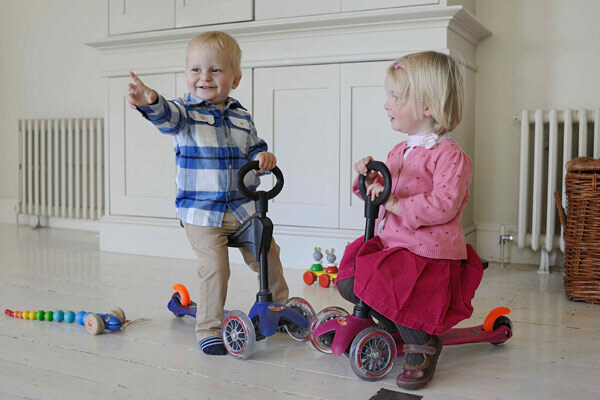 The hard-wearing Wheely Bug goes in any direction, and with its strong handle it’s suitable for toddlers from one year old and, if you opt for the large version, your kid will still be tearing around the house on it when they’re six. You can pick your favourite up at Classic Baby, where Wheely Bugs are priced from $79.95. Do you like your toys to do double duty? 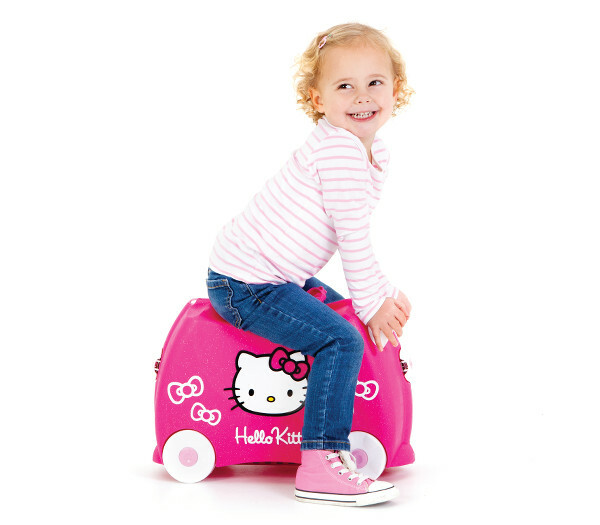 If you do, you’ll be thrilled by the new Hello Kitty version of Trunki, the ride on toy which doubles as a suitcase for kids. It’s the first ever pink and glittery Trunki, and it’s sure to excite some little girls out there this Christmas, while also fulfilling a travel need. What more could you ask for? Pick it up at The Stork Nest for $84.95. 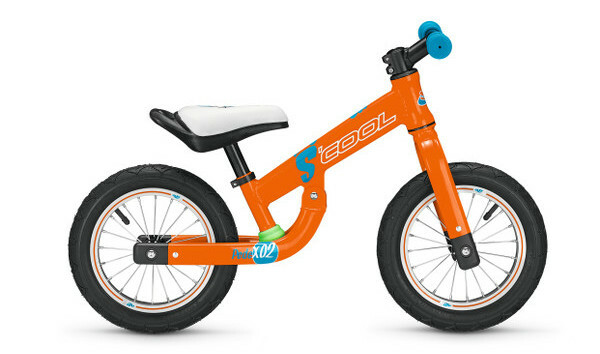 If you’re looking for a great value first balance bike, we’ve found it in the PedeX 02 from S’Cool Bikes. 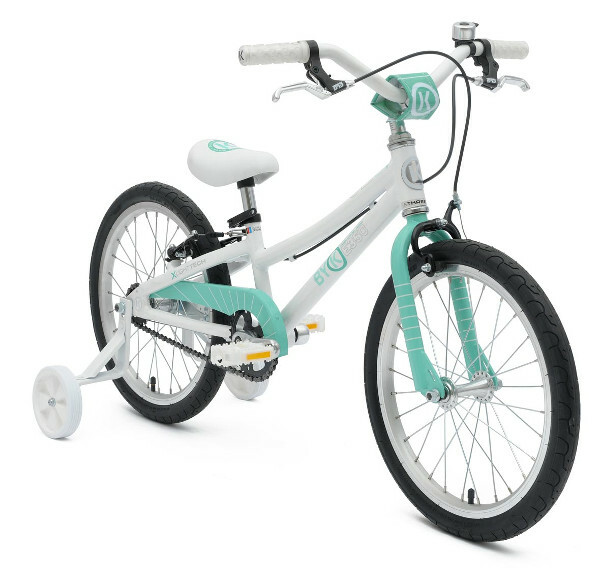 With bright and colourful good looks, it has a great suspension system which means it’s fabulous for kids who like to ride rough terrain (whether you want them to or not)! The large and comfortable saddle is great for getting kids used to riding, and even includes a handle for those times when you need to give tired riders a helping hand. It’s $229. Here’s a ride on toy with all the bells and whistles, literally! 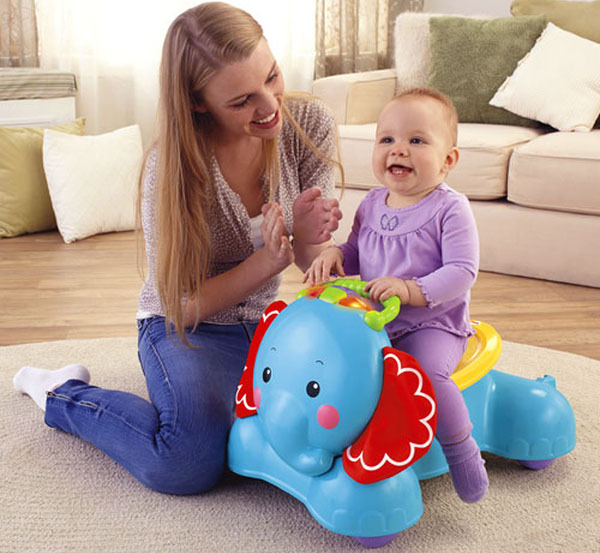 It’s the 3-in-1 Bounce, Stride and Ride Elephant from Fisher-Price. With lights, music and sound effects, this one is sure to keep your little one’s attention. Your younger toddler can bounce up and down on the elephant, as well as later using it as a walker and a ride on. It has a secure handle for grip and only needs two batteries. You can pick it up from Toys R Us for $129.99. This one is definitely a rocking horse with a difference – which is that you won’t have to stand next to it holding your little rider on for hours and hours. 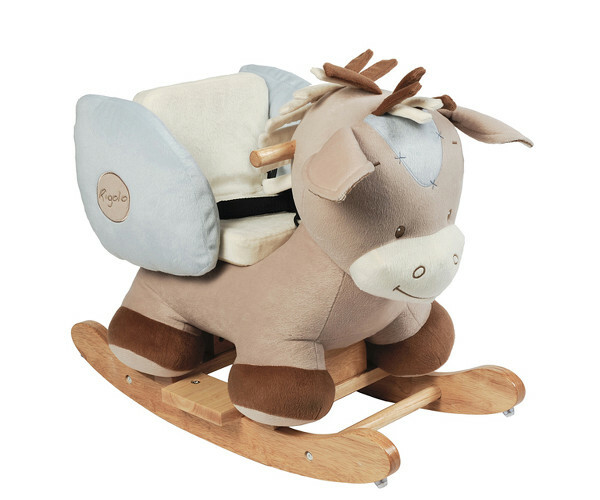 This gorgeous horse is one of the range of Nattou animal rockers, which all have a solid timber framed seat and safety strap to keep kids safely onboard. So if your child can sit upright, they can ride safely as well. Plus, aren’t they soft and cuddly? 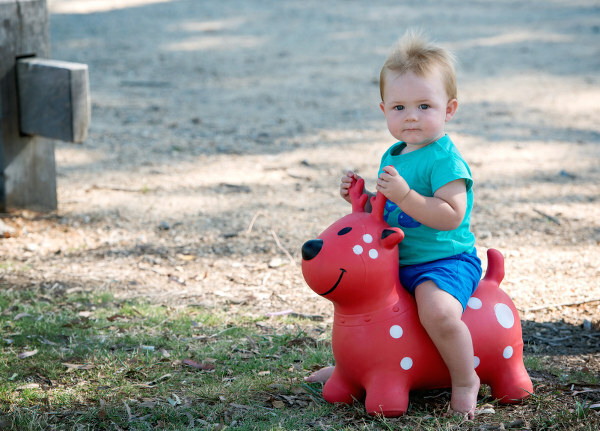 You’ll find Nattou rockers at Baby Bunting for $149, or check out Nattou stockists to find a store closer to you. 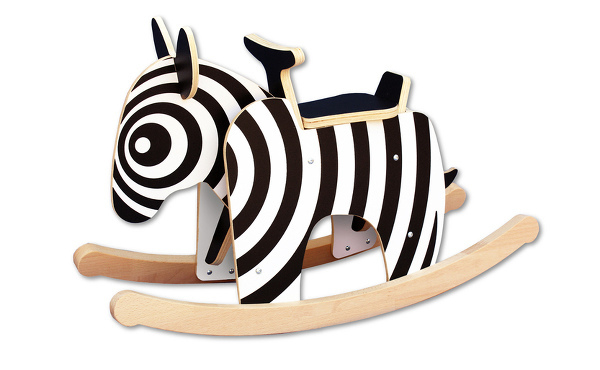 The Zebra Rocker from Newmakers might just rock your child (and you!) into a sleepy trance – it’s certainly a stand out in the ride on toys market. At £99, this ultra modern graphic rocker is a British design award winner which comes to you flat packed. It’s pretty out there, but it’s really striking and we love it. This one is suitable for children from 12 months. Last, but definitely not least – where would we be in a ride on toy list without a scooter? We can’t go past the Mini Micro – at $129.95 it’s a great first scooter for little ones because of its lean and steer action which means even preschoolers will be scooting with ease in no time. What’s more, you can buy the great Kick3 Mini Micro seat for $49.95, which simply slots into the scooter base and makes the scooter a smooth ride for kids from one year old! Pick them both up from Micro Scooters.